Sambalpur:16/8/18: Ahead of the general elections, as many as 1540 electronic voting machine (EVM) units reached Odisha’s Sambalpur town last night. 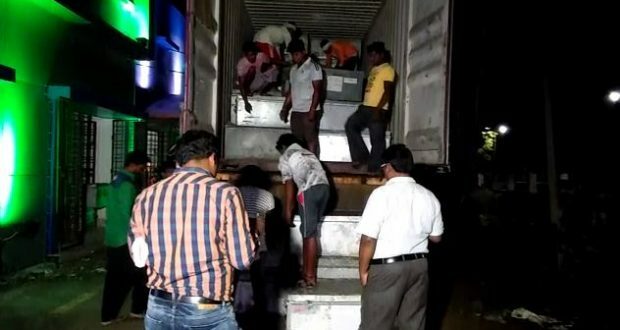 The EVMs were brought by trucks from Amroha, Ghaziabad and Gorakhpur. The machines have been kept at the Collector’s office amid tight security. All the processes are being carried out as per the direction of the Election Commission, Jena said. Couple of days ago, around 96,000 EVMs and an equal number of Voter Verifiable Paper Audit Trails (VVPATs) for the 2019 elections had reached the state. They were brought from Chhattisgarh, Assam, Maharashtra, Madhya Pradesh, West Bengal and Uttar Pradesh. State Chief Electoral Officer (CEO) Surendra Kumar had said that by September, all warehouses will be readied for safe keeping of the EVMs and VVPATs. For the first time, VVPATs will be used for General Elections in the State.